Much of elementary school mathematics is, quite simply, mindless drudgery. The math curriculum equates arithmetic, a necessary but pedestrian branch of the subject, with all of mathematics. Doing so wears out most students long before they have a chance to learn how deep, broad, and downright beautiful the subject really is. Even geometry, the tool used by the artist, architect, scientist, and engineer to think about shape and space, is presented as a series of dry “namings” and classifications of triangles and four-sided figures. You don’t take kids to the zoo to look at cats and dogs like those found in our neighborhoods! You go to see “exotic” and extraordinary creatures. Let me show you an animal, the Möbius Band, from Grandad’s Zoo of Exotic Geometry. 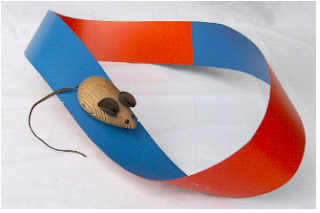 First identified by the German mathematician August Ferdinand Möbius in 1858, his band is easy to make, fun to explore, and you and the kids will remember it as one of geometry’s most fascinating creatures. Cut a sheet of copy paper lengthways into strips about 1 1⁄2 inches wide. Give each of the kids a strip and tell them to select their favorite crayon and color one side of the strip. 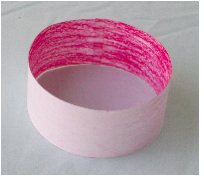 Have the kids form the strip into a ring by gluing or taping the ends. It’s not important whether the colored side is the inside or outside of the ring. Ask how many sides a ring has and they will tell you two (an inside and an outside). Inquire as to the number of edges, and they will identify two, a top edge and a bottom edge. Tell the kids to imagine that they are a tiny ant, walking on one of the sides of the ring. Ask, “Is possible to walk from one side of the ring, to the other side, without crossing an edge?” The answer is “no” because it’s the edges that separate the two sides of the ring. 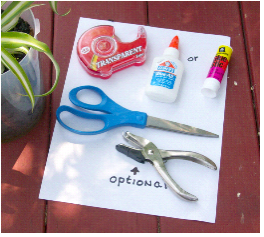 Give the kids another strip and tell them to label the ends as shown in the following picture. Have the kids lay the strip flat and again color one side. Tell them to turn the strip over so that the letters labeling the ends are visible. 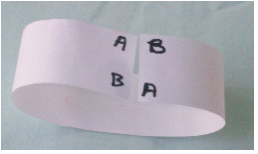 Show the kids how to give one end of the strip a half-twist and put the ends together so that A is opposite A and B is opposite B. Now, glue or tape the ends together as shown in this picture. They have now created a Möbius band. To get them to focus on the fact that the Möbius band has geometric properties quite different from a ring, tell them to continue coloring the band until it is completely colored as shown in the following picture. As they color the Möbius band, they might realize that they never crossed an edge but still managed to color the whole Möbius band. The band has a single side, not two! 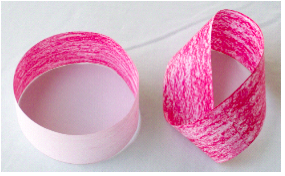 To help them better compare the ring and Möbius band, have the kids put them side by side and use a finger to trace along the edges of each figure. They will discover that the ring has two distinct edges. The finger has to be lifted from one edge and placed on the other edge in order to trace both edges. 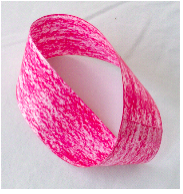 For the Möbius band, they discover that it has a single edge! An ant on the inside of the ring will have to cross an edge to get to the outside of the ring. 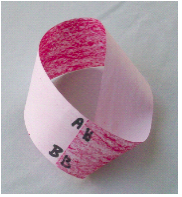 An ant on the surface of the Möbius band can visit every point on the band without crossing an edge! To summarize the experience, have the kids make a copy of this table and record the number edges and sides for each of the figures. This post is getting long and we’re not yet through exploring the geometric properties of a ring and a Möbius band. I’ll save for a later post how to use the hole punch and scissors to reveal even more surprises about the ring and Möbius band. Grandad made the Möbius Band shown in the following photograph when he taught middle school science and mathematics during the late 1960s and early 1970s. It hung in my classrooms through those years and in my various offices, up to the present time. The band is made from a thin metal strip and the mouse has a magnet in its base that keeps it stuck to the band. The Möbius band truly is an exotic geometrical animal.